Daw1 Aung San Suu Kyi2 was born on 19 June 1945. Her father, Aung San, negotiated Burma’s independence from the United Kingdom in 1947, and was assassinated by his rivals in the same year. She grew up with her mother, Khin Kyi. Suu Kyi was educated in English Catholic schools for much of her childhood in Burma. She continued her education at St Hugh’s College, Oxford, obtaining a B.A. degree in Philosophy, Politics, and Economics in 1969 and a Ph.D. at the School of Oriental and African Studies, University of London in 1985. She also worked for the government of the Union of Myanmar. In 1972, Aung San Suu Kyi married Dr. Michael Aris, a scholar of Tibetan culture, living abroad in Bhutan. The following year she gave birth to her first son, Alexander, in London; and in 1977 she had her second son, Kim. Aung San Suu Kyi returned to Burma in 1988 to take care of her ailing mother. By coincidence, in that year, the political and economic situation lead to mass demonstrations for democratisation, which were violently suppressed, culminating on August 8, 1988 (subsequently remembered as “8888”). A new military junta took power. Daw Suu Kyi was placed under house arrest on July 20, 1989 in Rangoon, under martial law that allows for detention without charge or trial for three years. The 1990 elections were won convincingly by Aung San Suu Kyi’s National League for Democracy (NLD), who took 392 of the 492 seats. However, the military junta refused to recognise the results, and ruled the country as the State Peace and Development Council until 2011. On July 10 1995 she was released from house arrest. On September 23rd 2000, Aung San Suu Kyi was placed under house arrest again, after she had continued her activities for democracy in Burma. After 19 months of this, she was freed on May 6, 2002. Following the Depayin massacre where she escaped her assassination by a mob of thugs, she was held in secret detention for over 3 months before being returned to house arrest on May 30 2003. On May 25, 2007, her house arrest was extended by one year. On October 24, 2007, she reached 12 years under house arrest. Solidarity protests held at 12 cities around the world. On Saturday, 22 September 2007, although still under house arrest, Suu Kyi made a brief public appearance at the gate of her residence in Yangon to accept the blessings of Buddhist monks who were marching in support of human rights. It was reported that she had been moved the following day to Insein Prison (where she had been detained in 2003), but meetings with UN envoy Ibrahim Gambari near her Rangoon home on 30 September and 2 October established that she remained under house arrest. Daw Aung San Suu Kyi, who has been detained without trial for 12 of the past 18 years, was seen being driven from the residence where she is held under house arrest to the state guest house where Ibrahim Gambari was staying on Saturday, March 8, 2008. Gambari, representing UN Secretary-General Ban Ki-moon, was scheduled to hold talks with Suu Kyi, but details of their meeting were likely to be closely held. Later, Suu Kyi refused to meet Gambari, allegedly because she doubted the efficiency of his endeavors. Her detention was prolonged in 2008. On 3 May 2009, an American man, identified as John Yettaw, swam across Inya Lake to her house uninvited and was arrested when he made his return trip three days later. On 13 May, Suu Kyi was arrested for violating the terms of her house arrest because the swimmer, who pleaded exhaustion, was allowed to stay in her house for two days before he attempted the swim back. Suu Kyi was later taken to Insein Prison and brought to court where she had to face an oviously biased trial, which in case of a conviction would bar her to publically support her party, the NLD, during the upcoming elections3. On 11 August 2009 the trial concluded with Suu Kyi being sentenced to imprisonment for three years with hard labour. This sentence was commuted by the military rulers to further house arrest of eighteen months. On the evening of 13 November 2010, Suu Kyi was released from house arrest. When by-elections were held in April 2012, she and the NLD party won 43 of the 45 seats and weeks later, Suu Kyi became the leader of the opposition. After she successfully made her way into the parliament, Suu Kyi started extensive travels abroad. She has, however, also been criticised for not speaking out clearly enough against human rights violations committed in Kachin State and against the Rohingyas. In 2015, Aung San Suu Kyi’s party NLD won the large majority of seats in the general elections. 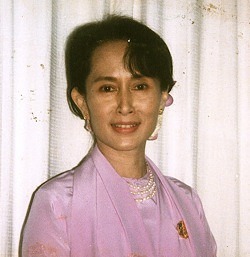 Although she was prohibited from becoming the President due to a clause in the constitution – her late husband and children are foreign citizens – she assumed the newly created role of State Counsellor. 1 The prepended honorific “Daw” is not actually part of the name but it is used in Burmese language when respectfully addressing a women. In Burmese, names are used without a prefix only when talking to or about little children. 2 Pronunciation /aʊŋˌsæn.suːˈtʃiː/, i.e. approximately: Aung like the ‘-own’ in ‘brown’ – Sahn – Suh – Chi. Burmese mostly don’t use first and last names and all syllables form one single name. However, Western media often use ‘Suu Kyi’ as a last name. The title ‘Daw’ (derived from the word for ‘aunt’, showing respect) is mandatory in Burmese culture. 3 These elections would anyway exclude her from all relevant positions and must for various reasons like this be considered intrinsically undemocratic.